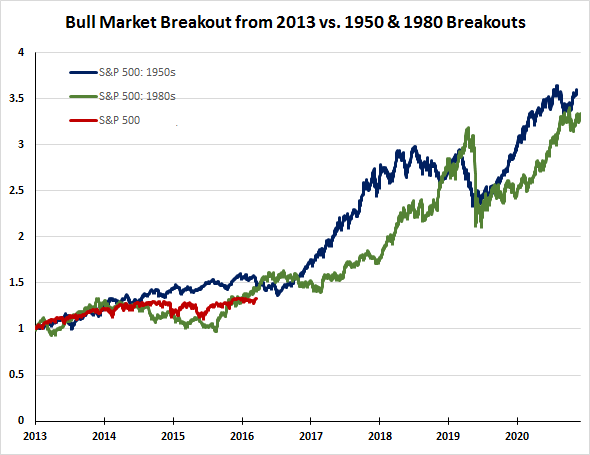 Subsequent to the election last month I published a post suggesting the equity market going forward was beginning to resemble the bull market of the 1950's and 1980's, A decade is a long time and market leadership will rotate in and out of sectors based on the business cycle. In that earlier post I noted the potential commonality to the current market compared to those prior decades related to policy decisions coming out of Washington, D.C. In the 1950's the Gross National Product in the U.S. more than double from 1945 to 1960. Government spending in the 1950's was targeted at construction of the interstate highway system, building of schools and an increase in military spending. In the 1980's President Reagan's policies focused on reducing the tax burden on Americans, lowering government regulation and shrinking government itself. President Elect Donald Trump also projects to implement similar policies, i.e., reduce regulation, shrink the government, increase spending on infrastructure and lower taxes. For investors the question to answer is what market segments worked then and might these same sectors outperform early in a Trump administration. 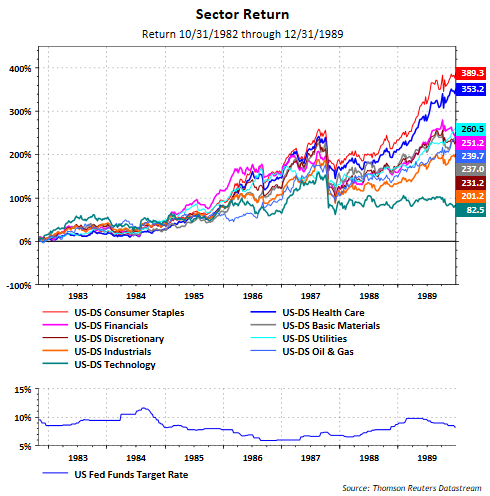 The chart below shows the sector return for the period following the early 1980's recession through 1989. 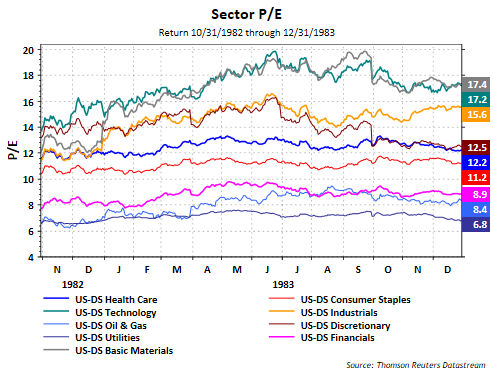 For the entire time period, staples, health care and utilities outperformed with technology being the laggard. 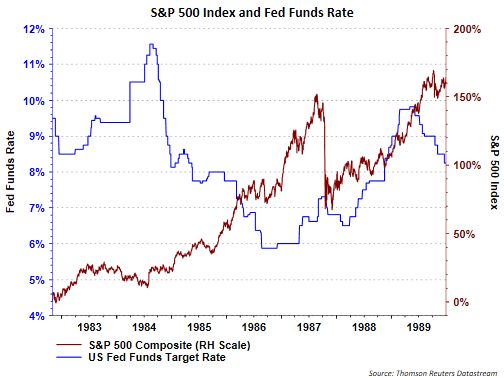 I include the Fed Funds target rate for reference since the current Fed is likley of the mind to continue its monetary tightening. In the second half of the 1980's the market continued its upward performance absent Black Monday in October of 1987. So what worked in the first year following the 1982 recession? The leading sectors were technology, industrials and materials. The laggards were health care and utilities. 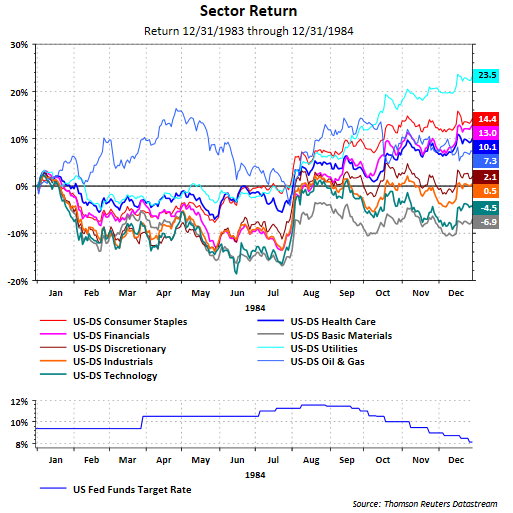 In the first six months of the period, financials were the second best performing sector. 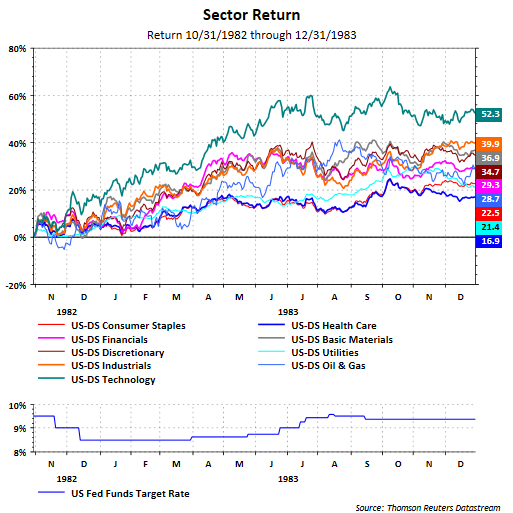 In 1984, utilities had strong returns in the back half of 1984 as the Fed's target rate declined and making it the best sector performer in 1984. 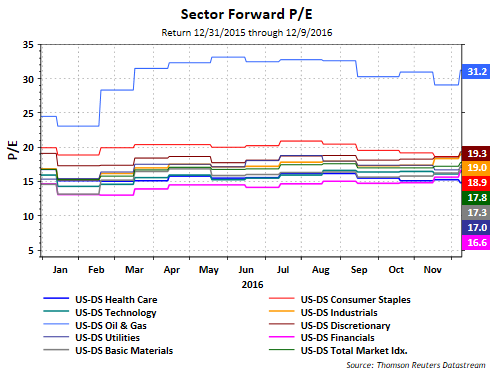 Staples and financials also outperformed while materials, technology and industrials lagged. A significant difference today versus the early 1980's is sector valuation. 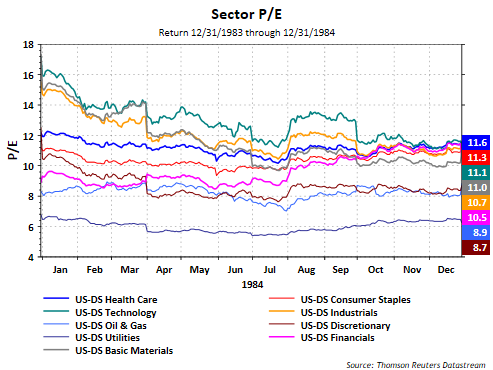 Below is the trailing P/Es for the sectors in 1983 and 1984. The last chart is the forward P/E today. 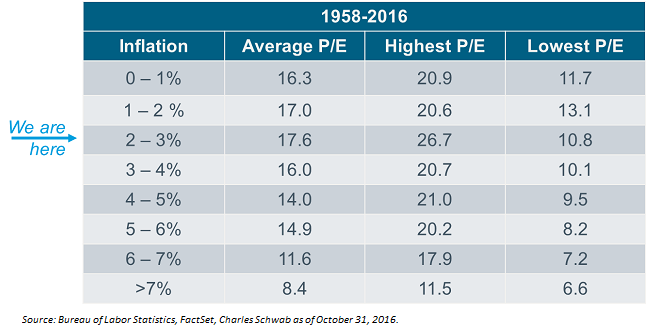 One factor influencing P/Es in the early 1980's was inflation. Paul Volcker, Fed Chairman in the early 80's pushed the Fed Funds rate up to as high as 19% in 1981 in an effort to contain inflation which was running at nearly 14%. Volcker's efforts were successful and from late 1982 through 1984 inflation averaged just under 4%. Over the last two years inflation has averaged just slightly more than half a percent, with the latest inflation reading just under 2%. If one believes there is some validity to the Rule of 20, then stocks currently are neither overvalued nor undervalued. If potential Washington policies result in faster economic growth, then anticipated earnings growth would be supportive of current valuations. In summary, if policies being proposed by a Trump administration result in similar outcomes as in the 1950's and 1980's, investors reviewing those prior time periods can obtain clues on stocks/sectors that might benefit the most. Recent market action, absent technology, seems to be resembling the decade of the 1980's at this point in time. As they say, history does not necessarily repeat itself exactly, but it does tend to rhyme.